Prestigious designation recognizes the company for services that help organizations mine data and harvest contextual insights for stronger business outcomes. 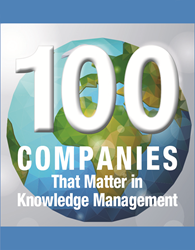 Earley Information Science is featured in KM World’s list of 100 Companies That Matter in Knowledge Management. The list, which was released today, is featured in the March 2016 issue of the publication. Earley Information Science was recognized for its services to help organizations mine data and harvest contextual insights for stronger business outcomes. “We are extremely pleased to receive this award and recognition,” said Seth Earley, Earley CEO. “Additionally, in January KMWorld, named Allstate Business Insurance as the winner of this year’s KM Reality Award and Earley Information Science as a key contributor to their success. The KM Reality Award recipient is an organization that demonstrates leadership in the implementation of knowledge management practices and processes by realizing measurable business benefits. About Earley Information Science: EIS helps organizations drive digital business innovation, enhance customer experiences, and increase operational performance. The company helps establish a strong information architecture and management foundation to drive strategic business outcomes and enhance operational performance. EIS has over 20 years of experience in working with Fortune 1000 organizations globally across many industries. Corporate headquarters are in the Boston metropolitan area with consultants working on projects around the world. For more about Earley Information Science visit our website at http://www.earley.com or contact us at info(at)earley(dot)com.